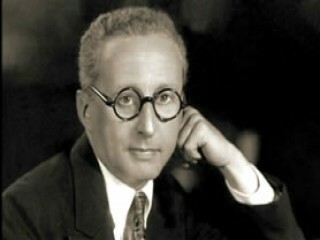 Jerome Kern was born in New York City on Jan. 27, 1885. His first music teacher was his pianist-mother. He later studied at the New York College of Music as well as in Europe. After working in the London theater, Kern returned to America, where the only work he could find was as a song plugger and pianist with a music publishing company. From 1905 to 1908 he was associated with a music company, rising to the vice presidency. He married Eva Leale in 1910, and they had a daughter. His first published score was an operetta, The Red Petticoat (1912). Between 1914 and 1929 Kern was represented on Broadway by at least one show a season. His prolific output included Rock a Bye Baby (1918), Sally (1920), and Sunny (1925). In 1926 he wrote the score for a Broadway adaptation of an Edna Ferber novel, and Oscar Hammerstein II wrote the lyrics. The result was the musical classic Show Boat. It opened in 1927 and ran for 572 performances. It was later twice made into a Hollywood film. One of its songs, "Ol' Man River," is perhaps Kern's most famous. In 1941 Show Boat was transposed into symphonic form and performed by the New York Philharmonic Orchestra. Other Kern successes include Music in the Air (1932) and Roberta (1933) and, for the movies, Swing Time (1936), You Were Never Lovelier (1942), and Centennial Summer (1946). Among his most popular songs are "My Bill," "Smoke Gets in Your Eyes," "Who?," "They Didn't Believe Me," "Look for the Silver Lining," and "The Last Time I Saw Paris" (his only hit song not written for a specific show). In the realm of serious music, Kern composed Portrait for Orchestra (Mark Twain), which had its world premiere in 1942 by the Cincinnati Symphony Orchestra, and Montage for Orchestral Suite for full orchestra and two pianos. Kern was interested in a number of scholarly pursuits. His collection of rare books brought nearly $2 million at auction in 1929. He was also a collector of art, a numismatist, and philatelist. In his 40-year career Kern wrote 104 stage and screen vehicles. At the time of his death on Nov. 11, 1945, he was in New York to cosponsor a new production of Show Boat. A film biography, Till the Clouds Roll By (1946), was one of many tributes paid to him. View the full website biography of Jerome Kern.